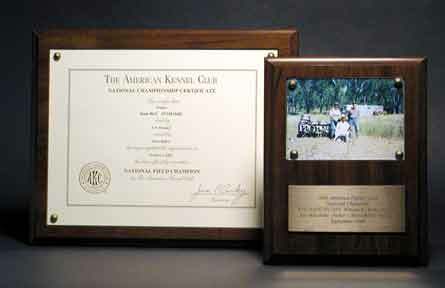 For a truly personalized award, Cherry Finished Photo/Certificate Frames are the answer. Smaller styles hold photos of dog and handler, the largest model holds a certificate - great for dog of the year awards, AKC Championship Certificates or other club honors. The photo or certificate is held under a protective acrylic cover. Certificates are sold separately, under part number CT. This page was last updated May 04, 2013.